Hatters attacker Harry Cornick has urged his side to put together another lengthy unbeaten run when they host Portsmouth in the FA Cup today. 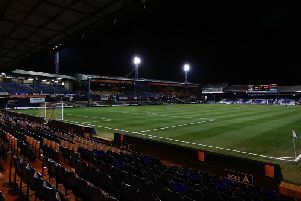 Luton saw their sequence of 10 games without defeat ended after Coventry City ran out 3-0 winners at Kenilworth Road last weekend. Town did bounce back immediately by beating AFC Wimbledon 2-1 in the Checkatrade Trophy with a much-changed side on Tuesday night, and Cornick wants to continue that form in front of their own fans this afternoon. He said: “I think it was just a one off really, we didn’t play our best on Saturday and things didn’t go our way, but we’ll put that behind us. “The last time we lost was against Swindon and that was 3-0 at home, so hopefully the same run after, that would be nice. Meanwhile Andrew Shinnie also wants his side to get back to winning ways after last weekend’s reverse. He continued: “We haven’t been as sharp the last couple of weeks in front of goal as obviously the weeks before. “It was maybe a tough week the week before, there was a lot of travelling, away games, it’s no excuse, but the boys were maybe just not as sharp as they have been the last few weeks. Shinnie believes his side can relish the potential freedom that comes with facing League One opponents, adding: “That’s one to look forward to for us. “You’re always looking who you’re going to get, we could have got a lower league team, minnows maybe come to here which potentially can be a tricky tie. “But Portsmouth will be a great game, a great atmosphere, there’ll come, they’re probably favourites to beat us.